This research aims to gain an understanding of the impact an Agile introduction has on the public service. The public service, pending an ongoing process for improving productivity, and of a relationship between work organization and tasks assignments, needs to differentiate from the roles and practices of traditional management. Agile helps lessen bureaucracy by setting clear objectives, responsibilities and expectations, and allows operational units to concentrate on productivity gains, higher adaptability of teams, reduced uncertainty and greater employee satisfaction. 3. Understanding barriers and benefits of Agile practicality in the public service. Findings highlight that the public service context lacks the necessary formal practices to organize employees into self-managed and autonomous units, capable of discussing operational performance, whilst confronting obstacles affecting productivity. Sampled public servants confirmed that Agile would yield better visibility, communications, and efficiency in their Section. The proposed concepts make them feel trusted, respected and give them a sense of ownership. Moreover, they feel inspired to work better, be more effective and produce more output, especially with the introduction of the team facilitator role. One major concern of participants is that the status quo culture impedes the implementation of Agile in the public service. However, there are those who see Agile as an opportunity to instigate a culture change while, others believe this is not possible. It also emerged that tested Agile practices have the potential to expose impediments to productivity including unwarranted bureaucratic processes. An important outcome reveals that well organized small sections within the public service tend to be more receptive to the proposed Agile concepts. In fact, some use methods similar to Agile which facilitates the process of such small sections to evolve into empowered Agile work teams. Agile is a particular way of working, often useful when the work is multifaceted, changing or ambiguous. Agile methodology is more associated with processes and methods (Broza, 2015). The principles that form the foundations of Agile methodologies necessitate the need of face-to-face communications, the need of processes that promote sustainable development, the need to measure progress based on functional components, the need to provide proper working environment to self-organized teams, and the need to deliver output in incremental steps based on short and fixed timescales (Waters, 2007). Those who in large organizations such as the public service, have vested interests in the status quo and the hierarchy, which Haines describes as the ‘auto pilot mindset’ or complacency have been informally promoting individualism and cynicism (2009:17). Agile is a revolutionary challenge to the management status quo, and therefore, has vast implications as to how an organization is run (Denning, 2016). Governments are commonly not considered as being predominantly fast when it comes to decision making. At the political level, the need for legislative examination and debate rightly limits the speed of decision making. However, the operational level of government does not necessarily have the same restrictions (Mitchell and Moore, 2014). In view of the absence of an ongoing process for improving procedures and policies, the Maltese public service has put in place many measures aimed to countermeasure delayed or poor quality services (Spiteri Gingell, 1995:71). The lack of an up-to-date and adequate communications channels to inform, explain and motivate was described as another issue disturbing public service operations (Spiteri Gingell, 1995). The absence of forward planning and lack of prioritization of objectives (Ex: funds), incremental processes that do not reflect actual government priorities (Polidano, 2002). 1.2 Why research is relevant? Agile is an approach based on incremental and iterative work sequences and a new way of managing teams and projects (Linchpinseo, 2016). Research evidence acknowledges that the adoption of at least one Agile methodology for software development projects improves the outcomes of quality, satisfaction, and productivity (Parsons, Ryu and Lal, 2007). Various case studies of Agile deployments in non-technical areas have been produced, and although statistical evidence is lacking such methods did prove to help re-engineer organizations to become more productive. Greasley discusses fast changing environments driven by demands for high quality services at low costs, which necessitates an organization to adopt an Agile operations strategy that prioritises human resources capabilities development (2008). Companies with highly engaged workforces outperform their peers, and employee engagement continues to be an important measurement of company performance in a tough economy and especially crucial during a recession (Sorenson, 2013). These two important attributes mentioned by Greasley and Sorenson – Agile operations and employee engagement – go hand in hand, and may offer a new and better way of operations in the public service. I consider this project as an attempt to confront operations within the public service from a different angle. Therefore, this project aims to explore an operational change in how public servants function and manage their work in order to prompt a positive variation which may lead to future improvements in operations management within specific sections of the public service. 2.1.1 What is Agile methodology? Set off by the failures of traditional approaches to managing software development projects, a group of practitioners motivated to find a better way to project management came up with an Agile philosophy in 2001 (Waters, 2007). Their claim is that they have uncovered an efficient and effective way of software development using Agile principles as clearly stated in their manifesto. The different approaches that aligned themselves to the Agile manifesto became known as Agile methodologies. The most popular methodologies are Dynamic Systems Development Method (DSDM), Scrum and Extreme Programming (XP). According to Waters, Scrum and XP are easier to implement because they tackle different aspects of software development projects (Waters, 2007). Scrum became popular because of the way it introduces Agility using a simple and flexible approach that addresses many of management difficulties during project execution. It emphasizes practical feedback, team self-management, and focus on building product increments within short iterations (Agile Methodology, 2008). In 1974, Edmonds published a paper on adaptive software development process phrasing such software development practices as ‘lightweight’. Early implementations of lightweight methods include Scrum (circa 1995) amongst others. These are now typically referred to as Agile methodologies (OMICS, 2014). A survey completed by Ambler in March 2006 collected responses from a large number of software developers who were using both traditional and Agile methods. The statistical analysis of the data collected reveals that Agile methods improve results of software development projects in terms of quality, satisfaction, and productivity. Parsons, Ryu and Lal also suggest that using a combination of Agile methods can be particularly beneficial. The adoption of at least one Agile method improves the outcomes of quality, satisfaction, and productivity over the use of non-Agile methods, without a significant increase in cost (2007). Another quantitative research of Agile methodologies concluded that the greater the iterative (Agile) approach reported, the higher the reported project success. The method used in this study has facilitated the process of interpreting and analysing findings of qualitative data collected during the investigation stage. NVivo 11 (Appendix H), a Computer Assisted/Aided Qualitative Data Analysis Software (CAQDAS) was utilised to further simplify the organising, filtering and transformation of raw data into a coherent data presentation. Furthermore, the pre-determined codes did not restrict new elements to emerge during the analytic process (Saunders et al, 2012:558). 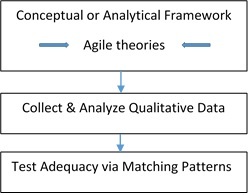 In fact emerging codes from the qualitative data analysis stage were developed and formed part of the final themes. Interviews with public servants were conducted during the months of January and February 2017. As already noted, the first part of the interview focused on the public service operational context in relation to Agile concepts (Part A). In general, elements were derived from the conceptual framework and refer to ‘what’ is today’s status, rather than ‘why’ or ‘how’ it evolved to this stage. This was done to assess the context from the participant’s point of view and at the same time introduce the relevant elements prior to the introduction of Agile concepts (Parts B and C). Therefore, Part A of the interview included elements relating to four main categories as shown in table 4.1. In general, public servants referred to their operational context as an environment with continuously changing objectives and tasks, and re-prioritization of both. Awareness of objectives is high, however, daily tasks are not always in line with the changing requirements. The context lacks the necessary formal practices to organize teams to discuss operational performance, share work load, and does not provides adequate decision making powers even within their own remit. Where standard operating practices exist, these happen on ad hoc basis. It is a normal practice to tackle obstacles outside their remit and almost none are consulted when setting deadlines (section 4.2). Most findings match the theoretical propositions derived from the literature review (section 4.1). The environment is unpredictable and sustains changing objectives and tasks, including changing priorities of both. It is unpredictable because assigned tasks do not always happen in relation to the section changing requirements. Therefore, this restricts employees’ identification with the section objectives and aims. The general awareness of goals and objectives by almost all participants signifies an improved context. Although, the majority stated that there are no formal team structures, in general they can share tasks with their colleagues, and work in teams on a need basis. This indicates that there is no formal shift to desegregated units. The lack of organized units or teams may lead to poor clarification of roles and disallow team members to distribute tasks based on skills and abilities. The lack of regular section meetings may be a consequence of the government practices of annual cycles for resourcing, setting objectives and performance management (section 4.2.4). Internal and informal agreed operational practices exist within the Ministry and which may be working fine for some sections but there is no harmonisation across all sections. In general, the focus is on the organisational structures rather than on operational processes. The context may require fixed deadlines to accomplish tasks however, no consistent process of consultation and negotiation exists. The traditional process of command and control and lack of decision making powers are prevalent. The context lacks a relationship between tasks’ assignments and work organisation, lacks the tools to assess and improve operations, and therefore risks operational stagnation (Section 4.2.3). 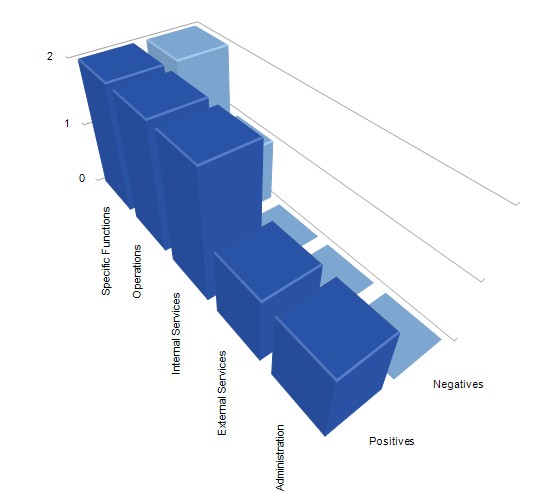 The confirmation by the majority of respondents that performance assessments are measured against the section objectives is a positive outcome, however, the same process is neglecting an aggregated measurement of performance and team based appraisals especially in a context where team co-operation is important. To add to the incomprehensible range of objectives, public servants are expected to tackle issues outside their remit. The lessening of burden or separation of obstacles outside public servants remit will allow them to concentrate on relevant tasks that contribute to the overall productivity of their section. Again, we see a context where regular discussions to enhance productivity are not formal and happen on ad hoc basis (Section 4.2.2). On further analysis of the outcome discussed above, I identified which factors if any represent the positive outcome regarding ‘standard operating procedures’ and ‘obstacles removal’. This was possible thanks to CASDAQ’s classification of cases and attributes relationship features (Appendix H). Primarily, this study explored elements related to Agile processes, practices and principles, however, Agile is much more than. The elements investigated in this study are found in the inner most circles of figure 6.1 below which depicts the Agile overarching mindset. The study was conducted in a context that is deprived from private sector methodologies in particular formal practices that organize employees efficiently and effectively. This study provided an opportunity to introduce fresh operational processes and practices which align themselves to the changing requirements, and principles which move away from the command and control, and chain of command style of management. Figure 6.1: Source: Simon Powers, adapted from Radtac. Public servants were introduced to new process and practices such as, the daily team and work cycles meetings, and the regular reviews of objectives and tasks with attached priorities. Also, the study introduced the concepts of short work cycles, obstacles handling, and the critical roles of a team facilitator and a section objectives (product/service) owner. Such processes and practices are easy to comprehend, practical to implement in any context and should improve work organization, however without principles they may be counter-productive. 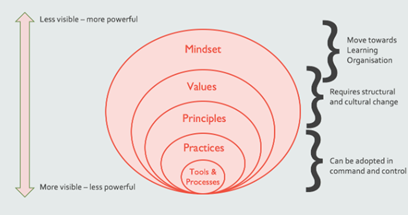 Principles may be interpreted as the commitments all key stakeholders make to form the foundation of a system like Agile. In this study the main principles introduced were the shift to ‘self-managed and autonomous teams’, and the ‘short cycles’ that all activities are programmed around. Consequently, these will guide public servants’ values as indicated by the participants themselves during the investigation such as, ‘we feel more trusted, responsible for work, and hence we try to achieve targets according to set timelines’. Without principles, employees will optimize around other beliefs and practices which may deny the public service from achieving more with its existing resources. Watermarks are the digital signatures that approve that the document is the property of an organization, a person or any legal authority. Sometimes, it requires removing watermarks from the documents due to personal or professional choices. For this, PDF Watermark Remover is available as a commercial solution and its functionality and features are elaborated in the upcoming sections. Smbexec is a tool that you can use for penetration testing domain controllers; the program allows running post exploitation for domain accounts and expanding the access to targeted network. This gives pentesters full access without any privilege requirement. Latest release includes improvements so it runs faster and there are more options in configuration and a module that support file search. Using smbexec allows easily going through all machines on the network and collecting the necessary information such as the UAC configuration or other system settings beside where the domain administrators’ credentials are in use.